Welcome to Sports Beyond Online! A great opportunity to prepare for the upcoming basketball season, with Coach Henry Guterson. He brings 14 years of coaching experience at the youth and high school JV and Varsity levels. Players will improve individual skills and team play through drills, games, and scrimmages. Effort, sportsmanship, and teamwork will be stressed. When practicing, Stephen Curry must swish 5 out of 10 free throws. Ray Allen is the first to the arena. Then he goes through a form shooting routine and progresses to 3-point shooting. I believe the following shooting routine will help you develop into a great shooter or make you an even better shooter. Maintains and develops sound shooting technique. Develops consistency in your form. And quite simply, it just makes you a better shooter. For youth and high school players or players looking to fix their shooting form, these progressions can be used in a shooting workout. For advanced players, it's a great way to warm up and refine your shooting technique. That way, you stay consistent. That's why guys like Stephen Curry and Ray Allen do the "boring" form shooting drills every day. We also want to add a shooting progression that we rarely see taught... we believe that this shooting progression will help a ton of players. Personally, I added these unique progressions to my workouts this last year and it has dramatically improved players that I work with. In the shooting progressions below, a 1-2 step is used. Even if a shooter we train predominately hops, I still use these progressions with the 1-2 step. I found that it was the best way for me to teach the proper rhythm and coordination of the entire shot motion. Then when we progress to drills with game shots, the player uses the hop. As a result, they have better rhythm and coordination with their shot. 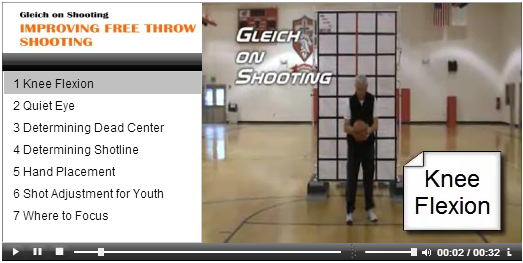 Coach Gleich has developed proven techniques to improve a player's shooting consistency. Here are some ways to become a better shooter, more specifically, a better free throw shooter. Click here. Support Sports Beyond while shopping on AmazonSmile - click on link to shop on Amazon. Total Package Basketball! The most popular and widely attended basketball training on the Peninsula. Senior High All-Star Event at Bremer Center. John Wooden's website on the Pyramid of Success! Every coach should teach these principles. Every player should lead by these principles. Life is a journey, create a legacy along the way! Habit 4 - Think "Win-Win"